A group of American scientists believes we can learn how our genes influence the onset of blindness by studying cave-dwelling fish in Mexico. According to a newly published study, these blind freshwater fish share over a dozen genetic markers with humans related to vision. This team of researchers from the University of Maryland studied freshwater fish known as Pachón blind cave morphs. These blind fish tend to live in very dark caves around Mexico. The reason scientists focused on these fish is because the cave morphs’ eyes deteriorate rapidly as they are growing up. Also, investigators hypothesized before this study that these fish share many of the genes responsible for the loss of vision in humans. 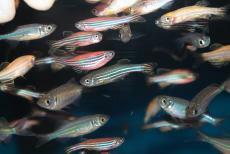 In their report, study authors revealed 26 genes that are silenced as the fish’s eyes develop. Interestingly, 19 of these genes are also involved in many human genetic eye disorders. Investigators believe this finding will help geneticists better understand how genes express themselves in patients with visual issues. Hopefully by studying how genes cause blindness in these fish, doctors will be able to develop novel gene therapies to prevent blinding disorders in humans. Dr. William Jeffery, who teaches at the University of Maryland’s Department of Biology, was a lead researcher on this project. A few other key study authors include Drs. Aniket V. Gore, Kelly A. Tomins, and James Iben. Staff from the National Institutes of Health also helped with this research.